Ketoprak is mostly sold by streetvendor in Indonesia. This Indonesian salad is very delicious and very easy to make. You don't need special skill or treatment to make this most simple Indonesian recipe. If you are vegetarian, you might like this salad. It's refreshing with cucumber and fresh light peanuts sauce. 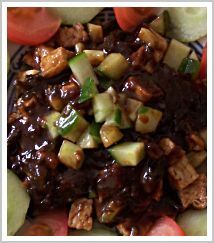 The sauce contains very much different ingredients than Gado-gado or pecel. Yes we have many kinds of peanuts sauce. This is one of the countless variation of Indonesian sauce. •	150 gram thin rice noodle, pour over with heat boiled water for about 5 minutes, set aside. •	200 gram mung bean sprouts, pour over with some heat boiled water for 5 minutes, set aside. 2. Put them into pan, add sugar, salt, sweet soya, and white vinegar, stir it, add water. 3. Let them cook in low fire, stir it softly the whole time until the mixture cooks. If you don’t stir it, you might get the burn parts on the bottom of your pan. 4. Arrange thin rice noodle, mung bean sprouts, tofu on the dish, pour some peanuts mixture over this. 5. Sprinkle some fried onion, celery and for the last, prawn crackers.